US Fed Ignoring the Real World Inflation Data - Bernanke Should Take a Hike! Jack Crooks writes: The slumping housing market and the ongoing credit crunch have been a major thorn-in-the-side for the U.S. economy for many months, and conditions are likely to get worse before they get better. However, does the big picture for the rest of the economy really look as bad as analysts and economists have made it appear? Third-quarter gross domestic product (GDP) rose 3.9% , exceeding estimates and outpacing the prior period's rate of growth. The strength came from larger-than-expected increases in personal consumption expenditures and exports. ADP, the payroll processing company, reported the U.S. economy added 106,000 jobs in October, following strong upwards revisions in prior months. We'll get another look at the labor market later this morning with the much-anticipated non-farm payrolls report. But the GDP figure and the ADP report are a big departure from the weak growth expectations we keep hearing about. This data further calls into question the Fed's latest decision to CUT RATES AGAIN . Bernanke is threatening to further break an already-battered greenback and send inflation soaring higher. If anything, he should stop cutting and start hiking! Heck, even the stock market knows this, which is why the Dow plunged more than 350 points yesterday. On Wednesday, Bernanke and his crew made another big decision — which I consider a big mistake — to cut both the fed funds and the discount rate by another quarter point. Their argument for the cut? They say core levels of inflation are improving, while housing continues to weaken and credit market woes linger. They say rate cuts will help support economic growth. But I think the Fed is playing with fire. As I just showed you, there are many reasons to believe that the economy doesn't need a boost. Meanwhile, core inflation is totally different than real world inflation. See, the Fed thinks food and energy are too volatile to consider when making monetary policy decisions, so they just exclude this stuff. If only it were that easy to ignore food and fuel out here in the real world! Are food and gas prices volatile? Absolutely … they're surging just about every single day! That doesn't mean we stop driving or eating. And that doesn't mean they should be excluded from the Fed's decisions. If anything, the fact that they're surging is precisely why they should be included in Fed policy decisions. Crude oil, in particular, is hitting new record highs on a regular basis. It pushed above $96 per barrel this week, and is making a beeline toward the $100 mark. Analysts are saying consumers can handle $90+ crude prices without taking a severe hit. But I'm convinced it's only a matter of time before they change their tune. Remember, crude oil fuels the entire U.S. economy, so rising prices will eventually find their way into the costs of all kinds of other goods and services farther down the chain. And that spells more inflation. No matter what way the Fed wants to spin it, inflation is happening in key commodities that we use every day. And it's the result of too much money and credit floating around the system, which is driving up prices. So, the answer to the problem is not ignoring what's happening in the real world. And it's certainly not pumping in EVEN MORE money. Ben Should Either Take a Lesson From Paul Volcker or Take a Hike! This is not the first time we've seen a situation like this. Back in the 1970s, the price of real stuff was soaring and the dollar was getting clobbered. Then Paul Volcker stepped in as Federal Reserve Chairman in 1979. He was faced with a tough task, and he had only one legitimate solution. But he had the guts to take action! Mr. Volcker enacted a policy of tough love. He pushed interest rates sharply higher. By January 1981, the Fed Funds rate had risen to a whopping 20%! That kind of shock forced the U.S. economy straight into a recession. 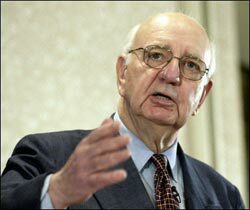 What Volcker understood, and what most people fail to realize, is that a recession is not necessarily a bad thing; it's the market's way of cleansing an economy. In the end, Volcker's gutsy, decisive action was just what the doctor ordered. It broke the back of inflation, and saved the dollar from ruin. Bottom Line: The Current Fed Is Letting the Music Play, and Risking a World of Hurt for All of Us! Just because "core inflation" isn't rearing its ugly head, today's Federal Reserve is doing everything it can to fend off the economy's natural cleansing cycle. But the longer they put off paying the piper, the greater the chance inflation will heat up. The rest of the world knows this. And that's why they're running as fast as they can out of the dollar. They have no other choice. Nobody wants to be left holding the bag. The smart money is exchanging dollars for stuff with real value. Remember, money loses its appeal if it can't maintain its value. And what good is a dollar if it can't buy you what it should? A currency is a medium of exchange for the new flat screen television in your living room and your weekly lawn service … as well as a store of value. Moreover, the true definition of inflation is not some hand-picked basket of goods. Inflation is a decline in the purchasing power of your currency. Period! So, keep your fingers crossed that, sooner or later, Fed Chairman Bernanke takes a page from former Fed Chairman Volcker's book and decides it's time to unleash some tough love on the U.S. economy. But also take decisive actions that will protect your wealth in the event that Bernanke won't! There are plenty of investments you can use, including currency ETFs, currency options, and hard assets like gold.